Located less than 2 hours from downtown Las Vegas, away from the city of lights is the beautiful State Park known as the Valley of Fire. This beautiful landscape of colourful rocks, shaped valleys, great hiking and camping is a must see for any visitor who loves nature. We ventured away from the lights to the park in order to explore the beauty of the park and the interesting angles of valleys found all throughout to do an engagement shoot with our soon to be married couple. In this photo we went to one of the river valleys which is shaped by the rushing of lots of water when it is available and we placed our couple down at the end of the valley while we found a location that showed the length and depth of the valley. I love how the picture shows the texture and colour of the rocks framing the soon to be bride and groom. 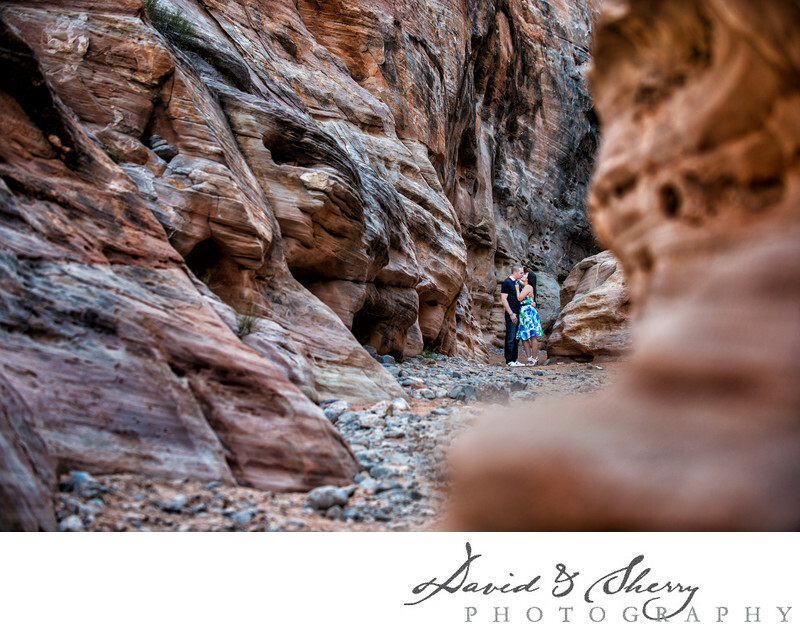 If you're looking for a really interesting location that is close to a big city but far from the ordinary consider hiring us for a photo shoot at the Valley of Fire State Park. We would love to get there again. Location: Valley of Fire State Park, NV.